WASHINGTON — The Postal Service has more than a billion Holiday themed stamps in stock from previous years, and has printed 800 million more to help Americans celebrate this year’s holiday season. Customers may purchase them now at usps.com/shop at this link or by calling 1-800-STAMP24 (1-800-782-6724). 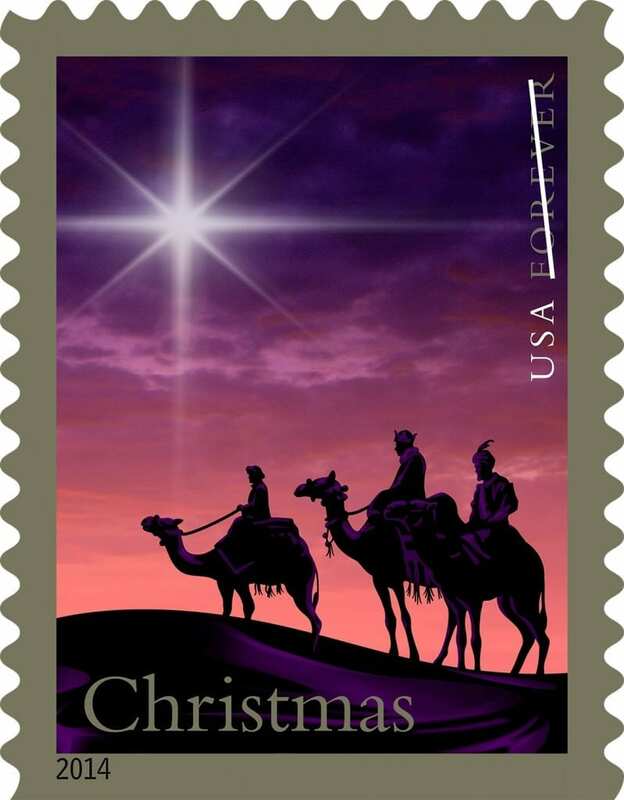 Here’s an alphabetical list of stamps available this year: A Charlie Brown Christmas; Geometric Snowflakes; Gingerbread Houses; Hanukkah; Holiday Baubles; Holy Family; Kwanzaa; Madonna of the Candelabra by Raphael; Neon Celebrate! ; Poinsettia; Virgin and Child by Jan Gossaert; and, Winter Fun. 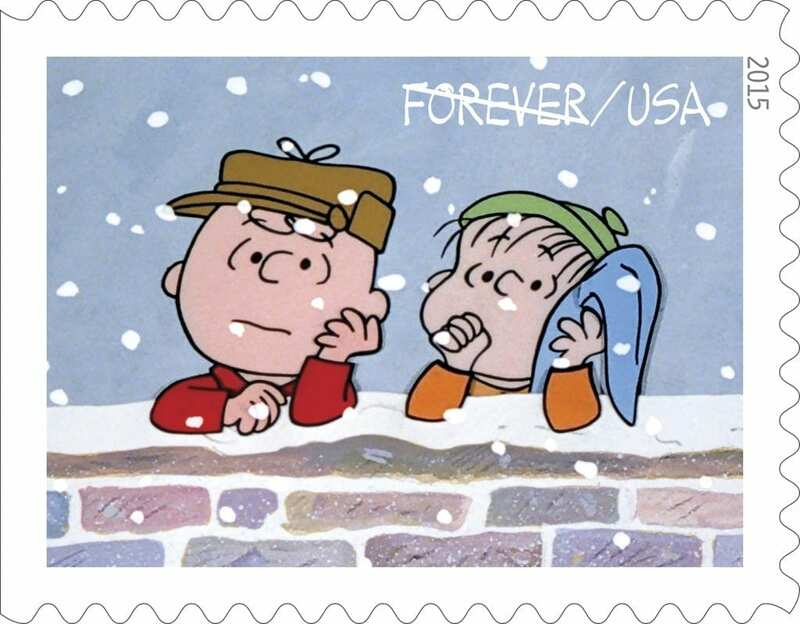 The stamp images include: Charlie holding the sapling that eventually becomes his Christmas tree; Charlie and Pigpen with a snowman; Snoopy and children ice skating; the cast of the program gathered around the Christmas tree; Linus kneeling by the sparsely decorated Christmas tree; Charlie checking his mailbox for a Christmas card; Charlie and Linus leaning on a snowy brick wall; Charlie and Linus standing by the Christmas tree; a frustrated Charlie standing in front of Snoopy’s doghouse; and, Charlie decorating the tree in front of the prize-winning lights display on Snoopy’s doghouse. 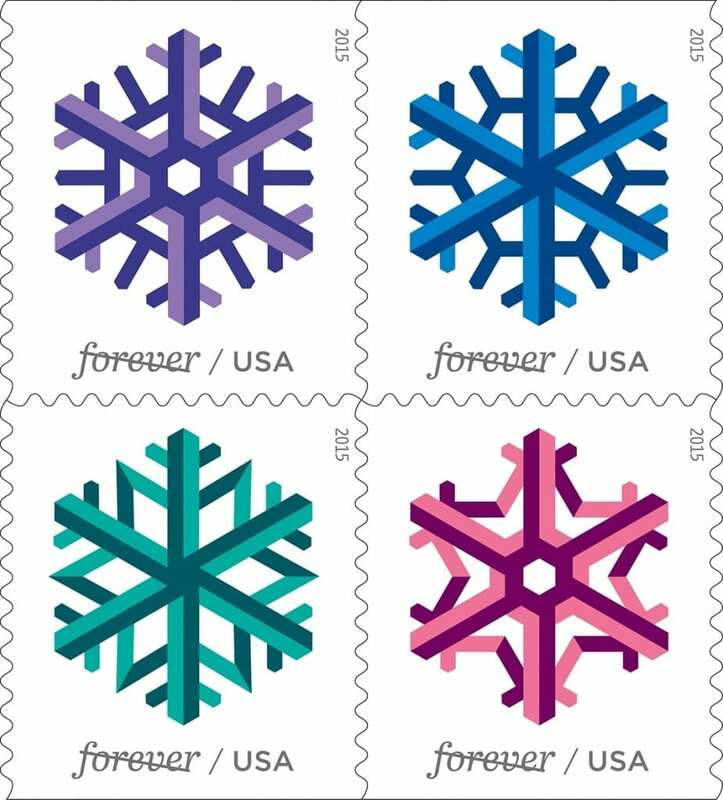 Each of the four Geometric Snowflakes stamps depicts a different snowflake. In nature, untold millions of ephemeral ice crystals form unique patterns that are as stunning in their complexity as they are fleeting. This infinite variety inspired the designers to experiment with different graphic shapes. Each snowflake is drawn in one of four colors: purple, pink, green, or blue. Applying light and dark shades of color enhanced the intricate geometry of each flake and added a feeling of playfulness to the stamp art. Four new, cheerful holiday stamps capture the delicious tradition and childlike nostalgia of making gingerbread houses. Stumbling across a magical cottage made of cake and candy, Hansel and Gretel knew just how special gingerbread houses could be — but no witches will jump out of these confectionery domiciles. Instead, the Gingerbread Houses stamps will add a touch of whimsy to your holiday mail. Celebrated by Jewish people around the world, Hanukkah, the joyous Festival of Lights, spans eight nights and days of remembrance and ritual. Central to the celebration is the hanukiah, a nine-branched menorah used only at Hanukkah. Eight of its branches represent each of the eight nights and days of Hanukkah, and the ninth, the shamash or “the servant,” is used to light the other candles. Happy Hanukkah! With eight colorful shapes and the silhouette of a dreidel, this stamp captures the joyous spirit of the Hanukkah festival. Evergreen trees and branches have been used as winter holiday decorations for hundreds of years. Trees were trimmed with fruit — apples were a popular choice — and nuts, candies, or paper. Glass ornaments first appeared in the late 19th century, in Germany, and their use quickly spread to other countries. While styles from the 1950s inspired the ornaments depicted in the stamp art, sincere wishes for happy holidays never go out of fashion. These stamps offer a fashionably “retro” way to enhance the season’s greetings. The Holy Family stamp celebrates Christmas with a scene from the Nativity story that reminds us of the joys of the season: family, togetherness, and the birth of the baby Jesus. It continues the Postal Service’s tradition of issuing beautiful and timeless Christmas stamps and will be a treasured addition to cards and letters sent during this season of goodwill and sharing. With this colorful stamp design, the Postal Service celebrates Kwanzaa, a non-religious holiday that takes place over seven days each year from Dec. 26-Jan. 1. Kwanzaa draws on African traditions and takes its name from the phrase for “first fruits” in Swahili, a widely spoken African language. This Christmas stamp features a detail from a work by the Italian master Raphael, entitled “Madonna of the Candelabra.” This tondo (circular painting), oil on panel, dates to around 1513. Good times call for good wishes. Bringing an extra wish for happiness to anyone celebrating a special time, this stamp features a brilliantly colored design crafted out of neon and glass that adds a spark to greeting cards, invitations, and gift-bearing envelopes and packages. The U.S. Postal Service continues its tradition of issuing classic holiday stamps with this bright and cheerful rendering of America’s favorite holiday flower, the poinsettia. The stamp art depicts the rich red and vibrant green leaves surrounding the flower — the cluster of small, rather modest cup-shaped structures in the center. The red “petals” that we think of as the flower are actually modified leaves called bracts. A potted poinsettia was used as art reference. Five centuries ago, Jan Gossaert helped bring the genius of the Italian Renaissance to northern Europe. Today, his devotional paintings, rich in symbolism, still vividly evoke the traditions of Christmas. Drawing on nostalgic images of snowy childhoods, the Winter Fun stamps can be used not only to convey the joyful spirit of the holiday season and the New Year, but also to send cheerful greetings for any occasion all winter long. The Postal Service expects to deliver more than 15.5 billion cards, letters, flats, and packages during the 2015 holiday season. In addition, it is projecting that approximately 600 million packages will be delivered between Thanksgiving and New Year’s Eve — an increase of 10.5 percent over last year’s volume.